Wahl's system of interchangeable screw-in nib assemblies was introduced at the end of the '20s; the excerpt below, taken from a 1930 magazine advertisement, gives some idea of the range of nib types available. The pen illustrated is a handsome and desirable green and bronze Equipoise. Interestingly enough, the nib assemblies were advertised as interchangeable by the dealer, not the customer. 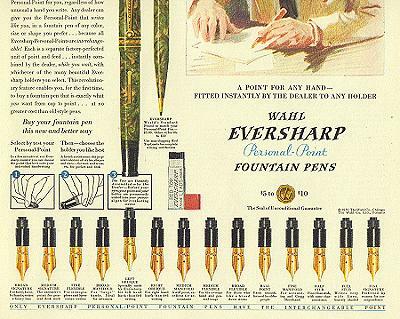 It would seem the entire idea was not to offer the customer the opportunity to use multiple nibs with a single pen (as with the later Esterbrook pens), but rather to enable the dealer to offer a full choice of nibs in a full range of Wahl pens without having to stock dozens of each model.